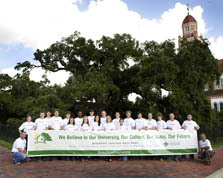 Team BeauSoleil designed and built the first house from the University of Louisiana at Lafayette to compete in the Solar Decathlon. The BeauSoleil house is designed to accommodate the culture of south Louisiana, which revolves around social and family ties. 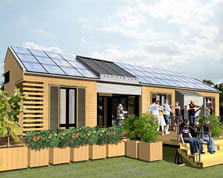 BeauSoleil, which means "sunshine" in Cajun French, is the name of the solar house designed and built by the team from the University of Louisiana at Lafayette, first-time competitors in the Solar Decathlon. The house is a hybrid structure in every sense. With a focus on the culture and lifestyle of south Louisiana, BeauSoleil combines traditional, local design concepts with the latest innovations in energy efficiency and solar technology. Because the majority of the team is native to the region, it considers the project deeply personal—and it shows. "I've been able to build a socially responsible house for the university, the culture, and the state that I love," says architecture student Gretchen Lacombe-Vanicor, the team's project manager. BeauSoleil's north-south orientation takes advantage of local breezes. Floor-to-ceiling windows provide ventilation and natural light, and louvered shutters and structural insulated panels reinforce the house against hurricane-force winds. The team developed many of the technical features of the house, but several members say the real challenge was seeing the project through to completion. "It's totally eye-opening," says Scott Chappuis, a project architect who returned to school to study architecture specifically to be part of the Solar Decathlon effort. In line with Cajun custom, the heart of BeauSoleil is a covered porch for socializing and entertaining. The porch is a 10-by-10-ft (3.1-by-3.1-m) space between the kitchen and living room that is bookended by sliding transparent doors that rotate 360 degrees around a track. The wall panels can transform the porch from an outdoor area to an indoor room. Atop the porch is a skylight, partially shaded on the south side by a unique solar thermal system that heats the house's water. The closed-loop system pumps water to a 50-gal (189-L) storage tank; an electric water heater provides backup. At night, the space glows with ambient light powered by energy collected from the sun. Electricity for BeauSoleil comes from 8 kW of photovoltaic (PV) panels on the south-facing portion of the roof. BeauSoleil's exterior cladding is a rain screen system, which allows air to circulate between the siding and the wall to minimize heat gain. Walls are made of 6.5-in. (16.5-cm) structural insulated panels, which provide double the insulation of stud walls and reinforce the strength of the building envelope. The house's efficient HVAC (heating, ventilation, and air conditioning) system includes a blower in each room, which enables residents to condition only the spaces they are using.